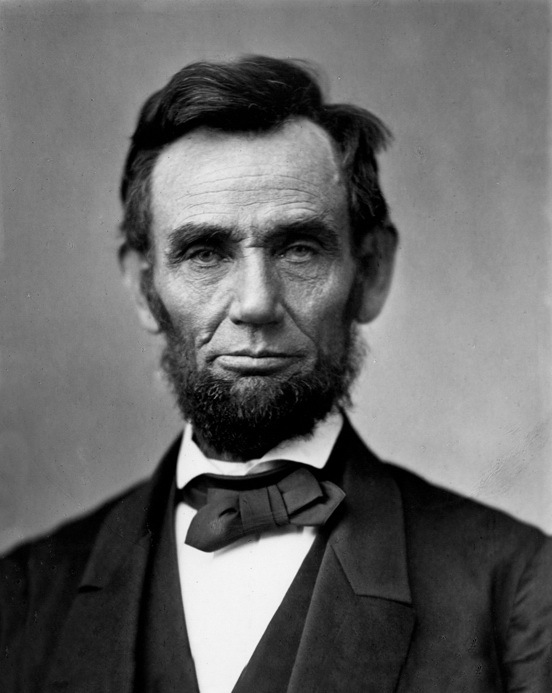 Abraham Lincoln was the 16th president of the United States and one of the great American leaders. His presidency was dominated by the American Civil War. Abraham Lincoln was born on 12 February 1809 near Hodgenville, Kentucky. He was brought up in Kentucky, Indiana and Illinois. His parents were poor pioneers and Lincoln was largely self-educated. In 1836, he qualified as a lawyer and went to work in a law practice in Springfield, Illinois. He sat in the state legislature from 1834 to 1842 and in 1846 was elected to Congress, representing the Whig Party for a term. In 1856, he joined the new Republican Party and in 1860 he was asked to run as their presidential candidate. In the presidential campaign, Lincoln made his opposition to slavery very clear. His victory provoked a crisis, with many southerners fearing that he would attempt to abolish slavery in the South. Seven southern states left the Union to form the Confederate States of America, also known as the Confederacy. Four more joined later. Lincoln vowed to preserve the Union even if it meant war. Fighting broke out in April 1861. Lincoln always defined the Civil War as a struggle to save the Union, but in January 1863 he nonetheless issued the Emancipation Proclamation, which freed all slaves in areas still under Confederate control. This was an important symbolic gesture that identified the Union's struggle as a war to end slavery. On 19 November 1863, Lincoln delivered his famous Gettysburg Address at the dedication of a cemetery at the site of the Battle of Gettysburg, a decisive Union victory that had taken place earlier in the year. On 9 April 1865, the Confederate general Robert E Lee surrendered, effectively ending the war. It had lasted for more than four years and 600,000 Americans had died. Less than a week later, Lincoln was shot while attending a performance at Ford's Theatre in Washington DC and died the next morning, 15 April 1865. His assassin, John Wilkes Booth, was a strong supporter of the Confederacy. People are just as happy as they make up their minds to be. Do I not destroy my enemies when I make them my friends? You have to do your own growing no matter how tall your grandfather was. It is not best to swap horses while crossing the river. Nobody has ever expected me to be president. In my poor, lean lank face nobody has ever seen that any cabbages were sprouting. In this sad world of ours, sorrow comes to all; and, to the young, it comes with bitterest agony, because it takes them unawares. Public sentiment is everything. With public sentiment, nothing can fail; without it, nothing can succeed. Every blade of grass is a study; and to produce two, where there was but one, is both a profit and a pleasure. It's my experience that folks who have no vices have generally very few virtues. Always bear in mind that your own resolution to succeed is more important than any other thing. That some achieve great success is proof to all that others can achieve it as well. The best way to predict your future is to create it. It is better to remain silent and be thought a fool than to open your mouth and remove all doubts. Upon the subject of education, not presuming to dictate any plan or system respecting it, I can only say that I view it as the most important subject which we as a people can be engaged in.